Here we are yet again, how are you this fine morning? 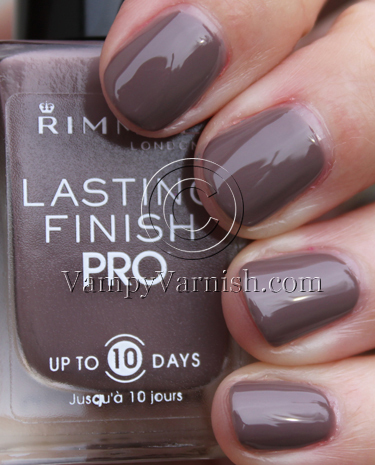 I was recently at Walgreens and noticed a new line of Rimmel’s called Lasting Finish Pro. I assume these are all new colors since I have never seen this line (or bottle shape) before. I picked up the four that looked the coolest, but I believe there were 2-4 others as well. The formula on these was REALLY great! I was very surprised and pleased. I really like the square bottle shape also they remind me of Sally Hansen’s Tracy Reese line, very sophisticated. All of these were just two coats with one exception. Read on! Steel Grey is a medium mushroom taupe creme. I really don’t know why they named it Steel Grey, because it’s definitely not a traditional “grey”. Either way this is yet another great mushroom in my collection. Here are some comparisons, in case you are wondering. It’s much lighter and has more of a pink tone than Chanel Particuliere. It has less grey and more pink in it than Barielle Putt-E-On Me. It’s much darker and more brown than Orly Country Club Khaki. It’s a totally different taupe than OPI You Don’t Know Jacques. This one was the only one that was three coats since it was a little more sheer than the others. Marine Blue is a medium blue with light blue shimmer. This is a gorgeous color for spring/summer, and I will certainly be wearing it soon. Two coats. 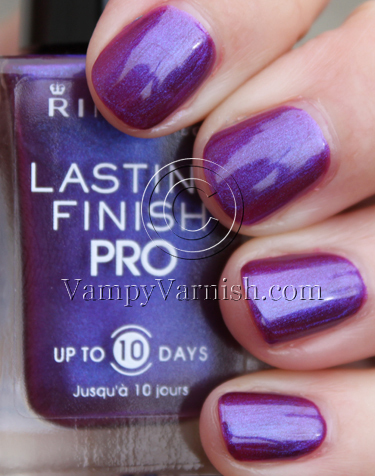 Violet Metal is a shimmery violet with an iridescent flash of deep purple, blue and pink. This is outstanding! The color is so totally amazing, and this picture wasn’t even taken on a sunny day! Seriously RUN to the store and get this if you can, it’s a must have! Two coats. 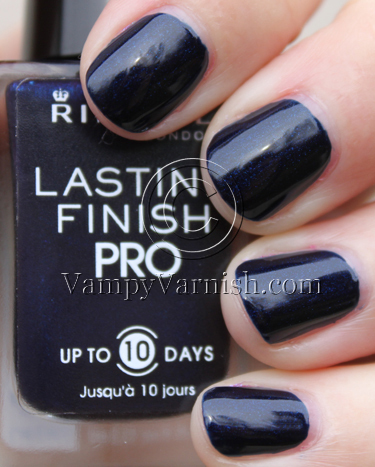 Midnight blue is a dark blue base with light blue shimmer. It’s very hard to tell here because of the clouds above, but this isn’t just a solid boring blue and it’s not black looking. It is in fact really pretty. This was two coats. I am super pleased with all of these and can’t wait to see what else Rimmel has in store in the near future! These were found at Walgreens and were about $4.30 each. Ohhh I really like Steel Grey! .-= SoVeryFabulous´s last blog ..NOTD: China Glaze VII =-. Steel Grey for me. Also Marine. I love the new bottles. I always understood Rimmel to be a British brand but I haven’t seen them here (UK) yet. I’m probably wrong though. Like I thought Butter London was British – but it’s not…. Thanks for the comparison swatches. Just shows what an eye for colour I have NOT got as the Chanel looks exactly the same to me! Apparently the company was started in 1834 in London and it was acquired by Coty, Inc. in 1996. The website doesn’t say exactly where the headquarters are, but I am under the impression also that this is a British brand. butter London is in the US, but started by a British woman. I saw Marine Blue when I was at WG yesterday. :slappingselfonhead: Why didn’t I get it? Gorge, all of them! Really pretty! Love the packaging better then their traditional round bottles! I have been meaning to stop off at Walgreens and pick these up. I think I am going to go for the taupe and the purple. Beautiful colors. Chic bottle. Nice price. Great swatches!!! Ooooooooh! Pretty!! The Violet Metal and Midnight Blue are gorgeous. I’ve been looking for an interesting dark blue. This might fit the bill. Will look out for these when I’m at the drugstore next. Thanks for the gorgeous swatches! The Steel Grey – though brown taupe in my eyes – is beautiful, so is the Violet Metal. I can share something odd with you: I’m currently on work-travel in a baltic country, in a place which isn’t exactly overfilled with high-end brands. I ran out of base coat, and grabbed the first I found, a Rimmel. It’s awesome! My polish will just not let go of my nails! After your post, I think I have under-estimated this brand. I’ll be getting some of those and test. .-= laquermanic´s last blog ..OPI – Over the taupe =-. I have violet metal and love it! Can you recommend a color like Midnight blue which has more visible/vibrant shimmer? .-= Phyrra´s last blog ..Detrivore BSOD’s Blue Mushroom =-. Milani’s Fairytale is similar, not quite as dark and with a lot of shimmer. Not sure if that was LE though. Also BB Couture Night Ops is very similar also, just not quite as dark. 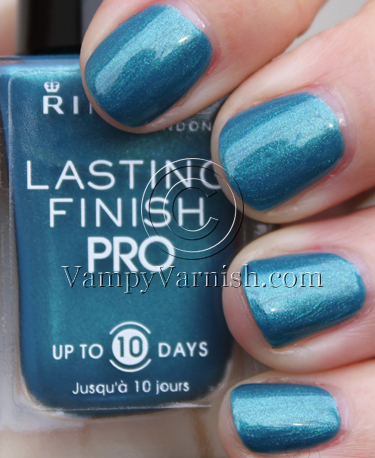 I’ve got a soft spot for Rimmel polishes – these look really nice & worth a try. How was the brush on these? Also can you show us some pics of the Steel Grey comparisons? I love the Rimmels I’ve had since high school. They are really good quality polishes in my experience. That Marine Blue seems to be a necessary in all this icky California weather. I need bright colors! .-= Legra´s last blog ..Tut tut, it looks like rain. =-. I haven’t bought a Rimmel since I got Green With Envy and had to chuck it because the application was just stupid so it’s good to hear these go on ok! Violet metal is just beautiful! Love, LOVE Steel Grey! I can’t usually wear taupes but hopefully this one will work out (if I can find it). BTW – will you be reviewing American Apparel’s new line of polish? A few colors look very promising! Violet Metal and Marine Blue are gorgeous! I think I’m gonna have to buy Marine Blue and Violet Metal, the last one is nice but I already have something just like it. .-= Laura´s last blog ..Tagged! Happy 101 meme =-.